This V-Commandos review was made after playing the game about 15 times. V-Commandos is a cooperative war game set during World War II in which players go on stealthy operations and try to complete objectives. You and your teammates play as specially trained Allied Forces units attempting to get behind Germany’s lines to slow their progress. V-Commandos was designed by Thibaud de la Touanne and is published by Triton Noir. 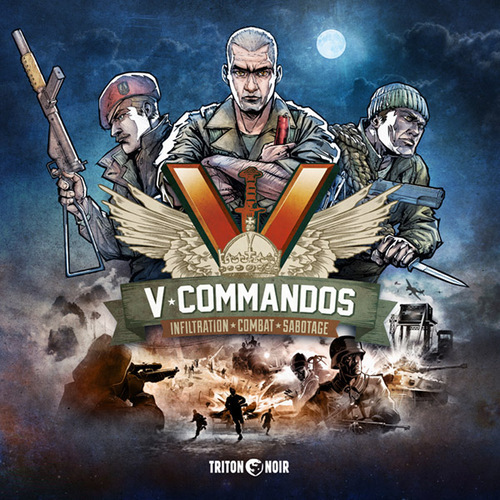 To set up a game of V-Commandos, you’ll choose an operation to play and then pick a number of commando characters based on the operation you are playing. Each operation has different terrains that you’ll need to set up, which include outdoor and indoor tiles, objective points, doors, enemy entrances, alarms, trap doors, and more. You can also choose to play a quicker game by simply playing one terrain card. The five commandos all have different special abilities and starting items. They all have weapons that permanently stay with them, but they also have slots for starting equipment and equipment that you pick up on your missions. Each commando card is double-sided, giving you multiple sets of special abilities and starting items to choose from. There are four phases that you’ll go through each turn: Event Phase, Commando Phase, Enemy Phase, and End of Turn Phase. During the Event Phase, you’ll flip over an Event card for each terrain in play. These cards tweak the rules a bit and can be good or bad for you. They also include a cardinal point, which tells you the direction enemies will move if they’re not moving towards commandos. During the Commando Phase, players get to take three actions apiece. There is no set player order, so anyone can take their three actions before moving on to any other player. You can move around the terrain, shoot Nazis, block enemy entrance points, blow up TNT charges, switch off alarms, and many more things. Most of these cost you one action apiece, but there are some that cost zero or even two actions. Movement is the key action in this game because you will want to stay as stealthy as possible as you attempt to complete objectives. There are small, medium and large tiles in the game, and you move to each one a bit differently. You can stay or become stealthy by moving onto a small tile by using one action, but it costs two actions to stay or become healthy when you move onto a medium tile. You always become visible when you enter a large tile. Whenever you move onto a tile with one or more enemy soldiers, you have to perform a Stealth Check by rolling a number of dice based on how many enemies are there. If you roll a 1 or a 2 on any of the dice, you become visible. Since you do want to stay stealthy, you only want to use your weapons when you need to. Many of the weapons you use will set off the alarms and will make you become visible. Of course, you also don’t want too many enemy soldiers in the way, so you will have to use your weapons from time to time. To do so, you will roll a number of dice based on the square pips shown on the weapon (your line of sight is one unblocked adjacent tile). Any results that are equal to or higher than the number found on the terrain tile you’re shooting into are successful hits. All killed enemies leave behind some equipment, which you can pick up for free when you are on those tiles. Whenever you become visible or make too much noise, the alarm will trigger on your terrain. You can turn it off when all commandos are stealthy, but you can only do this once. We’ll get to the real reason why you don’t want the alarm triggered when we go over the Enemy Phase. If you’re able to complete a terrain’s objectives, you’ll need to head for one of the trap doors on that terrain. When playing a quick game on a single terrain, just one commando needs to get through the trap door. During a full operation, all players will need to escape through a trap door (except for on the final terrain when only one commando needs to escape). During the Enemy Phase, enemy reinforcements will show up, they will move, and then they will fire at any visible commandos. Enemies spawn at the enemy entrance points around each terrain. One enemy will show up at each entrance point if the alarm is off, and two will show up if it is triggered. If there are any visible commandos on the terrain, enemies will move towards them during the movement step. If everyone is stealthy, enemies will move according to the cardinal point found on the current Event card for that terrain. If enemies move onto a tile where a commando is, you have to perform a Stealth Check. After they move, enemies will fire at any visible commandos within their line of sight. They roll dice based on the square pips on their tokens, ranging from one to three. Whenever you take a hit, you will put a -1 token on your character card, which gives you one less action on your turn. If your slots for these tokens ever fill up, you will need to be healed with a med kit before the end of the next turn. If your commando is killed, you can get a new one once the team has moved to a new terrain. The End of Turn Phase is when you check to see if the mission has succeeded or failed. If you’ve completed all of the objectives for the operation and at least one commando got out alive, then you win! You’ll lose if every commando was killed, if there are no enemies left in the reserve, or if you failed an objective. What really sets this apart from other war games is the fact that you are wanting to stay stealthy rather than just shooting everyone in your way. This adds quite a bit of tension to the game and makes you think long and hard about how you approach each mission. There aren’t many cooperative actions in this game, but there’s still plenty of collaboration. You pretty much have no chance to complete most of the missions unless you’re all on the same page. You have to figure out who will go after the objectives and who will take some chances by going after the Nazis. I hope I made that sound awesome because it really is! 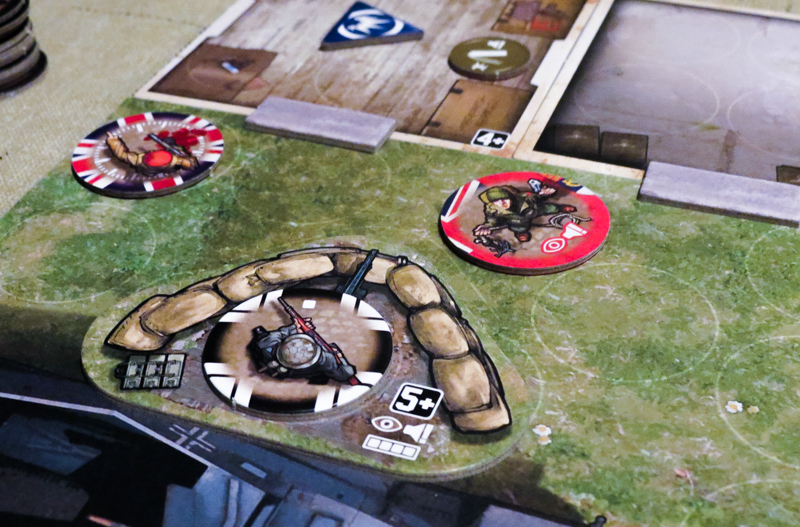 The artwork on the cards and tiles also helps to bring this World War II theme to life. There is a lot of content in the base game’s box. There are nine operations you can play, plus there are 26 terrains that you can use to play quick games. Each one has good replay value since the event cards are randomized and you never know how the enemies will move around. I didn’t even point this out in the gameplay overview, but it’s also great that you can easily make the game more difficult simply by adding in the “Special Rules” found on the operation cards. Obviously this adds even more to the replay value. You definitely can run into some alpha gamer issues in V-Commandos. All of the information is out there for everyone to see, so one person could try to take over. We’ve gotten past this by pretending like we have walkies and the current player initiates “contact” with anyone they want help from. It works! Setting up new terrains in the middle of a game can be a bit of a pain. There are a lot of little tokens that need to be put on each terrain, which doesn’t take too long to do but can take away some of that excitement you were feeling. Some people might actually like that, though, since it does allow you to breathe a bit before heading back into the action. 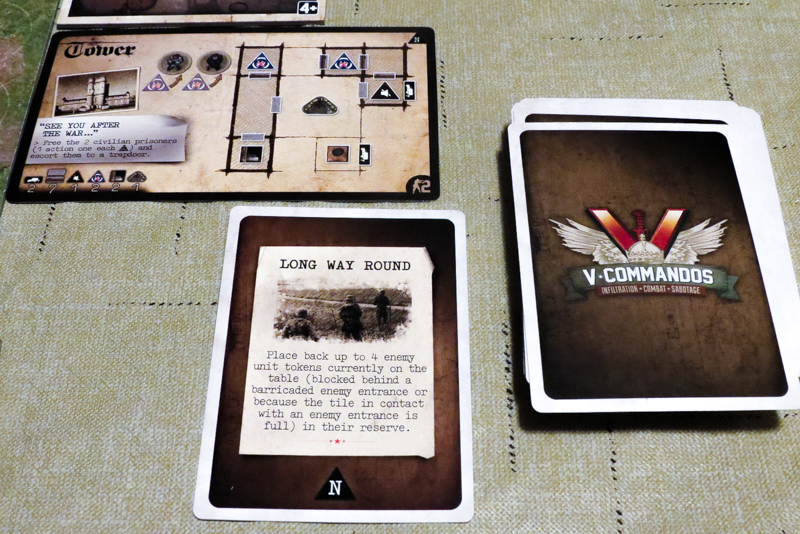 V-Commandos has replaced Memoir ’44 as my favorite light war game, though they do play quite differently. I think I like V-Commandos so much because the focus is on stealthiness rather than all-out battles. Right away it reminded me of the Hitman video games, which I LOVED playing back in the day. If you enjoy war games or you are like me and want to play any co-op that gives you a different type of fun and engaging experience, then definitely check out V-Commandos. I haven’t played D-Day Dice yet (review coming soon! 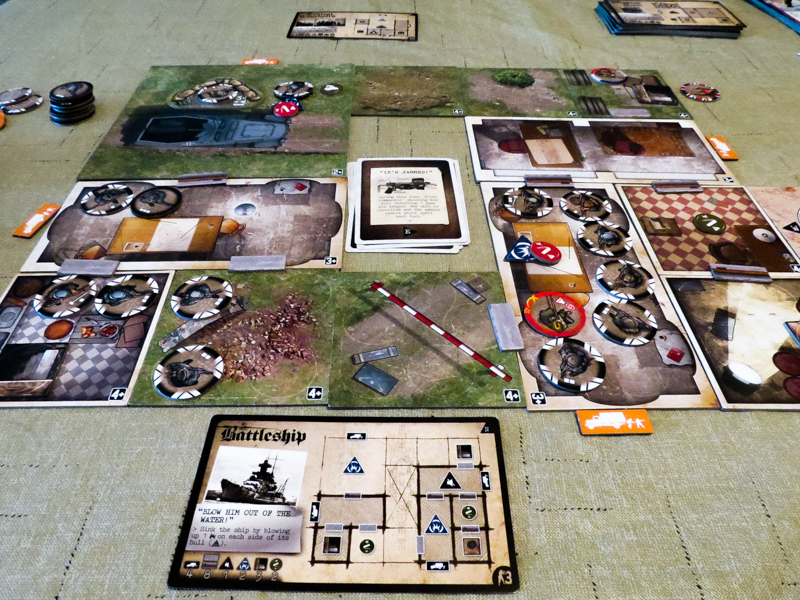 ), but for now this is the game I’d recommend to anyone looking for a cooperative war game. Thanks for taking the time to read our V-Commandos review! And thank you to Triton Noir for providing us with a copy of this game.